Mr Perry and Mr Reuse … deliver’d the same: Mr Watson told the prisoner, that he must put him on a pair of handcuffs for his security; he vehemently resisted the same, flying into the greatest passion, and endeavour’d to beat the Officers; upon searching him, they found a penknife conceal’d about his cloaths, with which ‘tis apprehended, he design’d to have cut the ropes, and attempted to escape out of the car … . 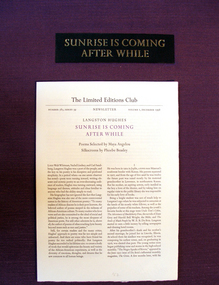 The Limited Editions Club created and published modern fine press editions for a small group of subscribers. 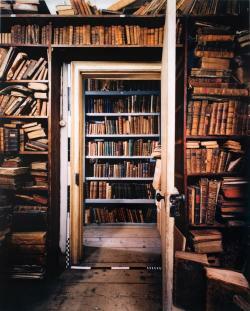 This was a high volume business, with as many as twelve projects completed each year in editions of 1500. The Club was founded and managed by George Macy (1900-1956) from 1929 to 1956; by Helen Macy from 1956 to 1968; and their son Jonathan Macy from 1968 to 1970. During the 1970s, the imprint was bought and sold several times, with little artistic success until 1978, when Sidney Shiff (1924-2010) took over. 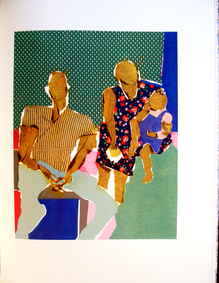 Under Shiff’s direction, a number of beautiful livres d’artistes were produced highlighting the work of African American writers and artists. 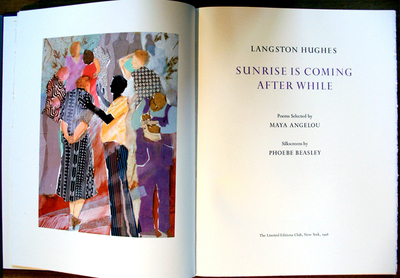 For the 1998 season, Shiff contacted the poet Maya Angelou (born Marguerite Annie Johnson, 1928) and LA artist Phoebe Beasley (born 1944) to develop a book of poetry by Langston Hughes (1902-1967). 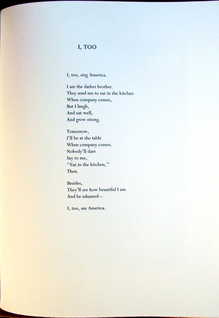 Angelou selected the poems and Beasley responded to them with six brightly colored screen prints. Angelou then completed the volume by writing both an introduction and an afterword. 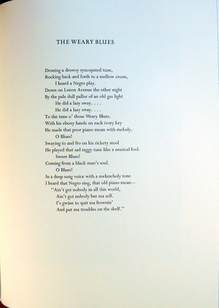 Drexel Press printed Beasley’s plates and the text was designed and hand-set in Monotype perpetua by Michael and Winifred Bixler. William Burton, “The Decline and Fall of The Limited Editions Club,” American Book Collector (July/August 1980). 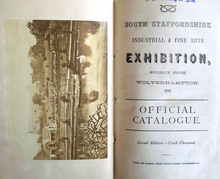 This is significant in that the South Staffordshire Industrial & Fine Arts Exhibition, opening May 11, 1869, highlighted the relatively new art of painting with light, or photography. 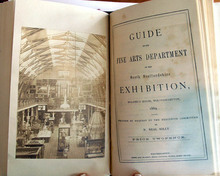 The catalogue of the exhibition, seen here, featured two original albumen prints trimmed and pasted into every copy. Note that ours is the second edition, tenth thousand issue. Such a large edition was necessary, given the fair welcomed over 200,000 visitors in just five months. The life and career of actor Frederick Henry Yates (1797-1842) is closely tied to that of actor Charles Mathews (1776-1835). They met in the winter of 1817-18, when Mathews convinced Yates to become an actor. After a successful early career, Yates purchased and managed the Adelphi Theatre in London in partnership with Mathews, while also continuing to perform. Mathews developed a one-man play called At Home, in which he revived each of his most successful roles in a single evening. 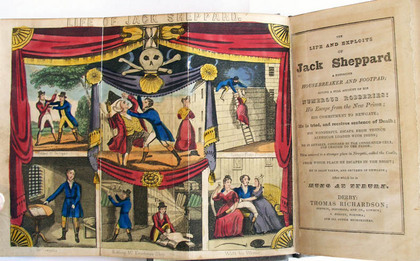 Yates attempted the same format, which he called Yates’ Reminiscences, first performed in Edinburgh in 1827. 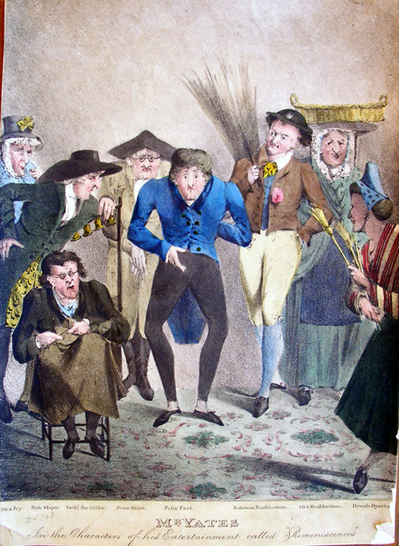 The genre has been called a monopolylogue and this print shows the various roles Yates would play during the evening, including Mrs. Pry, Bob Major, Nathaniel the Cobbler, Peter Snick, Fleix Fact, Solomon Rushbottom, Mrs. Rushbottom, and Brush-flyettn. The Dutch-English artist Egbert van Heemskerck II (ca 1674-1744) is represented in the graphic arts collection by eight hand-colored etchings. We believe these are by Heemskerck the younger, although both father and son had the same name and attribution of their works has been questioned. Originally from Haarlem, the family settled in London and Heemskerck was briefly a singer at Sadler’s Wells. William Hogarth, another eighteenth-century painter, is said to have been fond of Heemskerck’s work and may have used this series as a reference for his Fourth Stage of Cruelty, among other works. 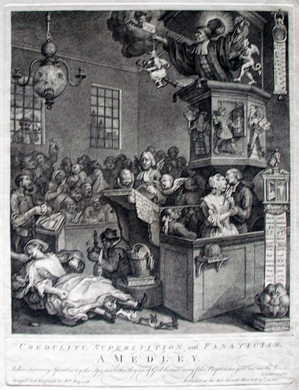 Like Hogarth, Heemskerck first painted the series and then, had the images translated into prints for wide distribution. 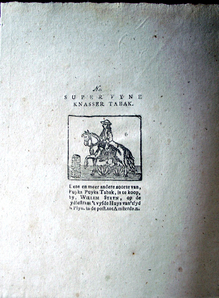 The eight are all satires on eighteenth-century life, with animal heads on (somewhat) human bodies. 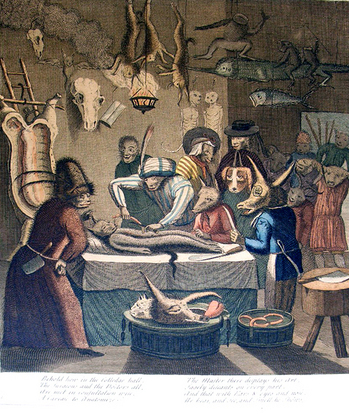 The image seen here is a satire on quacks and quackery, offering a depiction of modern medical practices. 1.Behold how in the colledge hall, the surgeons and the doctors all, Are met in consultation wise, a carcase to anatomize: the master there displays his art, sagely discants on every part, and that with ears & eyes and nose, we hear, and see, and smell, he shows. 4.A barbers shop a medley shews, of monsters, wigs, drawn-teeth and news, while one is shav’d another bleeds, a third the Grub Street Journal reads. 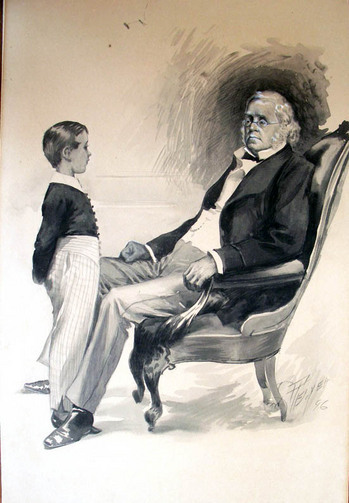 The master full of Whig and Tory, talks politics and tells a story, and swears he is not such a sot, but that he knows full well, what’s what. 5.Now gentlemen - see here’s a piece - I hope you’ll all bid up for this. Two Guineas - thirty shillings - twenty. Sure gentlemen that will content ye. Who bids? Fifteen dye say? For shame tis not the vaule of the frame. Sixteen is bid for’t - once - twice - thrice, sixteen - tis going at half the price. 7.While thus the revelling debauchee, dandles his mistress on his knee, th’ old baud is reckoning up the score, of all that has been spent and more. In comes the monarch of the night, and puts them in a horrid fright, the lover swears, the lady shrieks, behind the door the bully sneeks. 8.While thus the revelling debauchee, dandles his mistress on his knee, th’ old baud is reckoning up the score, of all that has been spent and more. In comes the monarch of the night, and puts them in a horrid fright, the lover swears, the lady shrieks, behind the door the bully sneeks. Dr. G…..t. D.D., June 26, 1806. Hand-colored etching. 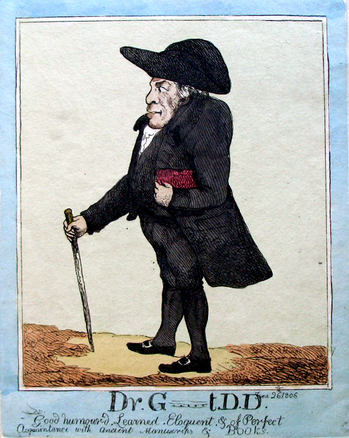 Graphic Arts British caricature. 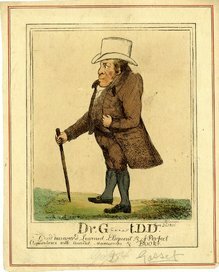 Both the British Museum and Princeton’s graphic arts collection hold a copy of this 1806 caricature of an antiquarian, etched by an anonymous artist. The coloring is different and so are the hats, but each gentleman is described similarly as “Good humoured. Learned. Eloquent & of Perfect Acquaintance with Ancient Manuscripts & Books.” Happily, a hand-written note on the BM sheet identifies this doctor of divinity as Dr. Gasset. On May 6, 1931, the first of 33,000,000 people walked through the gates of the Exposition coloniale internationale in the eastern suburbs of Paris. 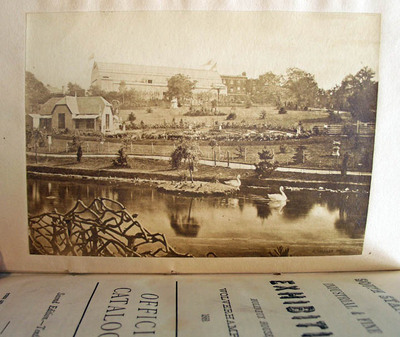 The exposition, which continued for six months, included a recreation of Mount Vernon from the United States, along with pavilions from Italy, Japan, and many other countries. 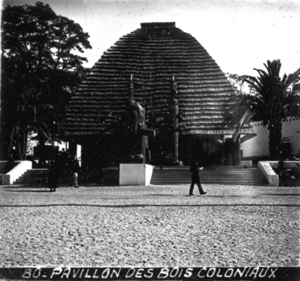 The majority of the expo’s 500 acres of land was used to present the French colonies of the period. 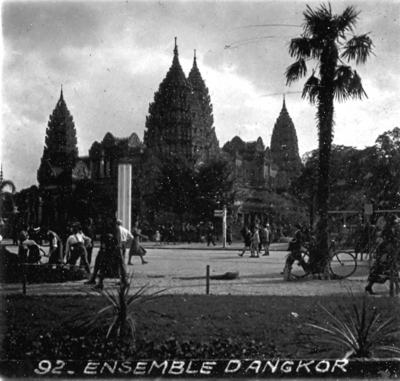 Buildings were recreated and native men and women traveled to Paris to perform their music and dance; demonstrate their crafts and foods; and present the customs of their daily life. Particularly popular was a display of an entire tribe of nomadic Senegalese peoples. 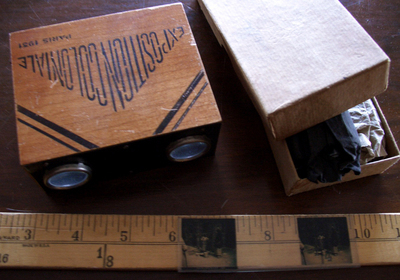 Graphic Arts holds a souvenir stereoscopic viewer with 46 tiny glass slides from the 1931 exposition. Here are a few of the images. I apologize for the quality. The miniature scale (approximately one inch square) and uneven photography means we will have to digitize each image individually, rather than in groups. 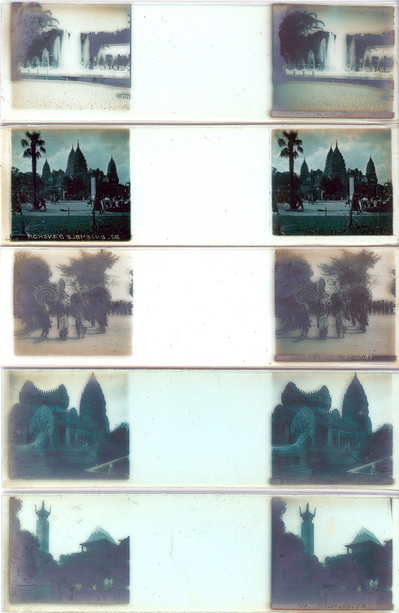 Stereoscopic slides and viewer depicting scenes from Exposition coloniale, 1931. GA 2007.04407. Purchased with funds provided by Robert J. Ruben, Class of 1955. For more information, see: 1931, les étrangers au temps de l’exposition colonial (Paris: Gallimard: Cité nationale de l’histoire de l’immigration, 2008). Firestone Library JV7915 .A15 2008. Born in Portugal, Antonio Parra y Callado traveled to Cuba around 1771 on a commission from Madrid’s newly established Royal Cabinet of Natural History (later called the National Museum of Natural Sciences). The thirty-two-year-old enthusiast, with no academic training, collected plants and seeds to be sent back to the museum’s Botanical Garden. Parra quickly became fascinated with the Cuban culture, the topography, and the diverse natural history of the Caribbean. His studies expanded, eventually focusing on marine life, collecting and documenting specimens of salt and fresh water fish, crustaceans, corals, eels, turtles, and other marine plant life over the next thirty years. Parra married and his son, Manuel Antonio Parra y Muñoz, was born in Havana. 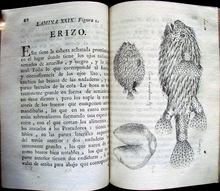 A talented artist, Manuel joined his father’s research team while still a teen-ager, sketching, etching, and printing images of the specimens they collected. 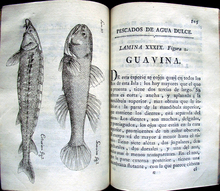 Together they published an exhaustive study of the fish of Cuba, which is believed to be the first scientific treatise published in Cuba, as well as the first Cuban illustrated book. 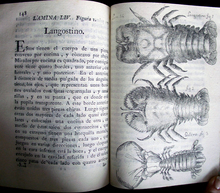 The volume describes and illustrates sixty different species of fish and twenty-three crustaceans. 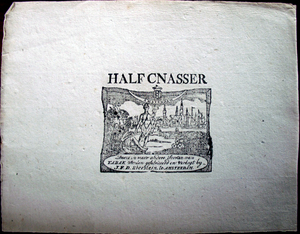 Among the most interesting is a folding plate following the title page that presents a group of lobsters on an elaborate silver platter. 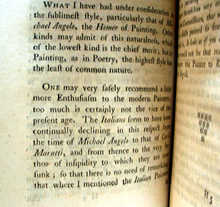 The book’s plates account for nearly one half of the island’s production of printed images in the eighteenth century. Parra established his own Cabinet of Natural History in Havana; I wonder if anyone reading this has been there? The final chapter, added without explanation, documents a black slave with an enlarged hernia. Identified by researchers at the John Carter Brown Library as Domingo Fernández, this man was one of the first Caribbean slaves to be depicted in a published source. 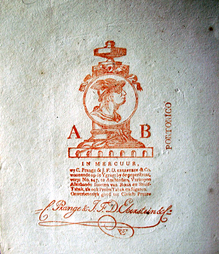 Antonio Parra y Callado (1739-18?? 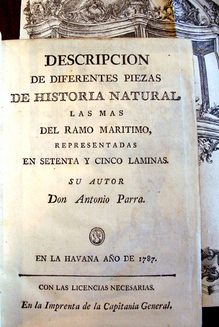 ), Descripcion de diferentes piezas de historia natural las mas del ramo maritimo: representadas en setenta y cinco laminas (Havana: En la imprenta de la Capitanía General, 1787). 75 copper plate etchings, one hand colored. Graphic Arts (GAX) in process. Purchased with the fund given by Kenneth H. Rockey, Class of 1916, in memory of his wife, Isabel A. Rockey. 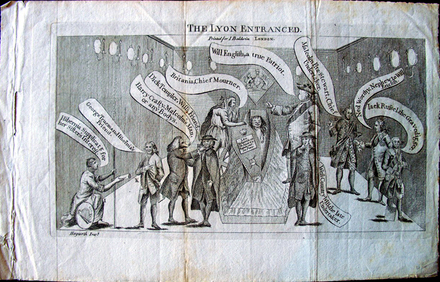 This eighteenth-century etching entitled The Lyon Entranced is inscribed with the name of William Hogarth (1697-1764) as designer, although there is no similarly titled funeral scene within Hogarth’s prints. 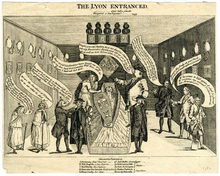 Change a few characters and add to the dialog balloons, and you have a print owned by the British Museum, seen at the left. 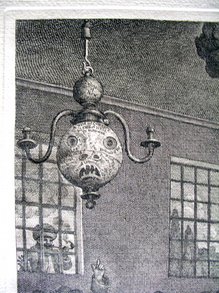 However, this etching, dated September 29, 1762, makes no mention of Hogarth. The scene depicts the last private meeting between British leaders (Cumberland, York, Bute, Fox, Bedford, Pitt, Temple, and Newcastle), before the signing of the preliminary articles of peace, which ended the French and Indian War, also known as the Seven Years’ War, on November 3, 1762. Hogarth designed and published a very different satirical print in reaction to the politics of the day, which he called The Times (see earlier post). Also dated September 1762, Hogarth’s dramatic print shows Pitt fanning the flames of war, while London goes up in smoke. Perhaps the publisher of the scene above thought he could ride on the coattails of Hogarth’s success but later, reconsidered and removed Hogarth’s name before the print’s final state? Thomas Nast (1840-1902), Leaders of the Democratic Party, 1868. 38 x 24 inches (96 x 61 cm). 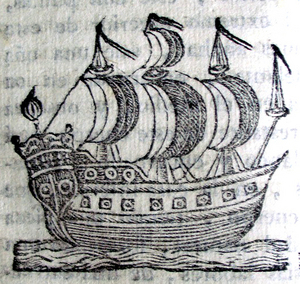 Wood engraved broadside. Graphic arts GA2010- in process. 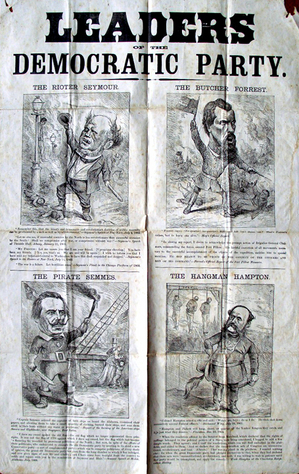 Bernard Reilly, American Political Prints, 1766-1876 (Boston, Mass. : G.K. Hall, 1991). 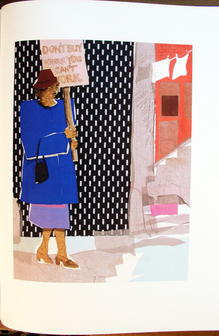 Graphic Arts Collection (GA) Oversize E183.3 .R45 1991q. “Tobacco was among the first commodities to be sold in printed paper wrappers,” writes Michael Twyman, in his Enclyclopedia of Ephemera. Here are three recently acquired nineteenth-century examples from Amsterdam. Inscribed: Believe not every Spirit, but try the Spirits whether they are of God: because many false Prophets are gone out into the World. 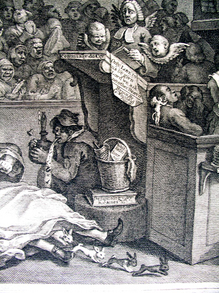 William Hogarth (1697-1764), Credulity, Superstition, and Fanaticism. A Medley. 15 March 1762. Etching with engraving. 3rd state. Graphic Arts, William Hogarth Collection. This plate is a reworking of the unpublished Enthusiasm Delineated, engraved in 1760. It shows the interior of a Methodist meeting house, possibly Whitefield’s Tabernacle, in Tottenham Court Road. It is fun to note the preacher’s text is “I speak as a fool” (2 Corinthians, ii.23); the chandelier is inscribed “New and Correct Globe of Hell”; and the woman on the floor is Mary Toft, the Rabbit Woman. The original Mary Toft attracted attention in the fall of 1726, when she claimed to have delivered several rabbits (one per day). At the end of November, she was brought to London to perform this feat but ultimately confessed that she had inserted the rabbit into her uterus. It is not known for certain why Hogarth began this scene under one title and published it, greatly revised, under another. Paulson suggests that Hogarth was originally influenced by an essay in the Idler written by Sir Joshua Reynolds (EX 3804.3.342), seen at the left. In this piece, Reynolds advocates for more enthusiasm in painting. 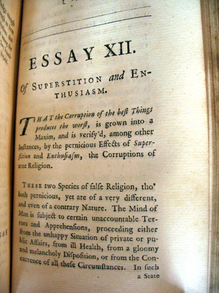 Later, Hogarth may have decided to switch titles after reading David Hume’s Essays, Moral and Political (EX 6100.1741). One particular chapter, entitled “Of Superstition and Enthusiasm” distinguishes between enthusiasm deriving from presumption and pride, and superstition deriving from weakness and fear. 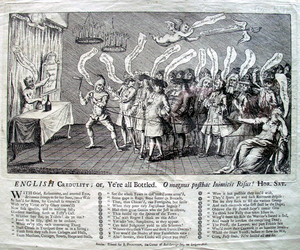 One last image he might have seen was the popular broadside on English credulity, satirizing the play The Bottle Conjuror Hoax at the Haymarket Theatre. 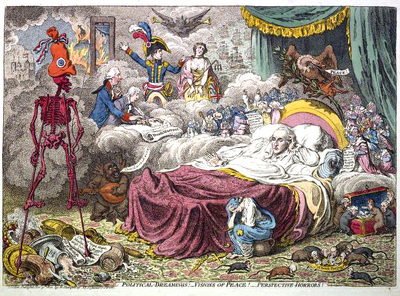 James Gillray (1757-1815), Political-Dreamings! -Visions of Peace! -Perspective Horrors! November 9, 1801. Hand-colored etching. Graphic Arts (GA) 2006.01460. Gift of Dickson Q. Brown, Class of 1895. Not quite fifty years after Hogarth published his Election series, James Gillray offered his own commentary on contemporary politics (one of many). This print was so popular that the large stock was exhausted in just a few days. A thorough description of each character, human and animal, can be found by searching the title at: http://www.britishmuseum.org/research/search_the_collection_database. In the meantime, here’s a synopsis of their research. In the bed lies the statesman William Windham (1750-1810), Lord Lieutenant of Ireland and War Minister in the first phase of the conflict with France; later he became Secretary for War and Colonies. Above his head is an olive branch bent down by the weight of a vulture, who says “Peace!” while killing a rabbit. On the left is Death standing on British trophies. One catalogue suggests a reference to Milton’s Paradise Lost: “Death Grinn’d horrible a ghastly smile, to hear His famine should be fill’d … “. On the extreme left is the Tower of London flying the French flag. Bonaparte is holding a rope attached to Britannia’s neck and a fat demon (Whig Charles James Fox (1749-1806)) is playing a guitar while London burns. Justice sits on a chamber-pot nearby. For more, see M. Dorothy George, Catalogue of Political and Personal Satires in the British Museum, VIII, 1947.